At this time of year, after dark we in the northern hemisphere are able to see the mighty constellation of Orion rise high in the sky with a very bright companion in a nearby constellation: Sirius – The Dog Star. 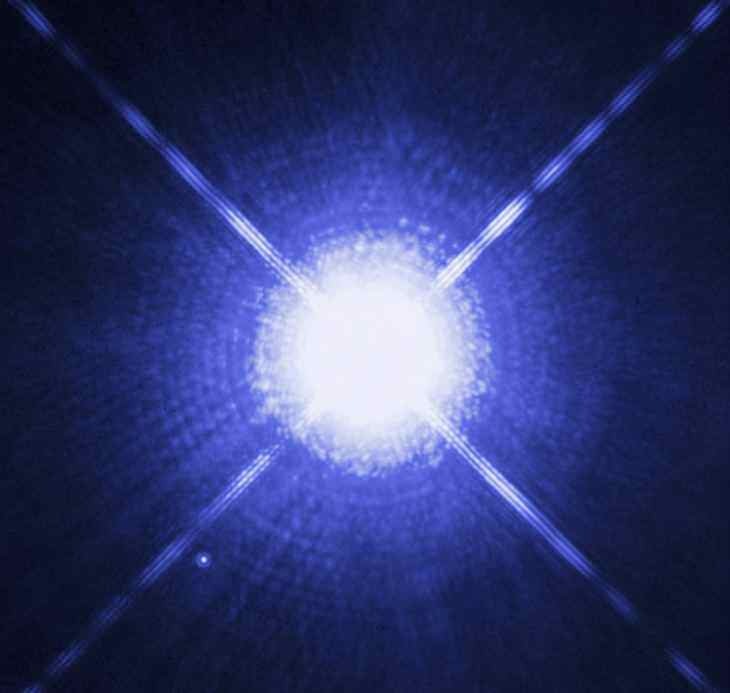 Sirius (α CMa) is the alpha star in this trusty hound and is roughly 8.5 light years away from Earth, making it one of the closest stars to us. It has a tiny companion star making it a binary system composed of “Sirius A” the main component (which is a white main sequence star) and “Sirius B,” a white dwarf star. As seen with the naked eye, Sirius can be seen to twinkle many different colours low in the winter evening sky. So why does Sirius twinkle? It’s not just Sirius that twinkles; all stars twinkle. Light travels many light years from stars and right at the end of its journey, it hits Earth’s atmosphere, which consists of nitrogen, oxygen and other gasses. Earth’s atmosphere is constantly swirling around, and wind and air currents etc distort light travelling through it. This causes the light to slightly bend or shimmer and the light from distant stars twinkle. An extreme, more down-to-Earth example of this would be heat rising off of a road or a desert causing objects behind it to distort, shimmer and change colour. Sirius appears to twinkle or shimmer more than other stars for some very simple reasons. It is very bright, which can amplify atmospheric effects and it is also very low down in the atmosphere for those in the northern hemisphere. We are actually looking at it through a very dense part of the atmosphere which can be turbulent and contain many different particles and dust. The lower towards the horizon an observer is looking, the thicker the atmosphere. The higher an observer is looking, the thinner the atmosphere. This is also the cause of colourful sunrise and sunsets. This optical illusion is a big pain for astronomers and some very large telescopes such as those in Chile and Hawaii use special equipment and techniques to reduce the effects of the atmosphere. One of most famous telescope of them all, the Hubble Space Telescope doesn’t get affected at all by our atmosphere as it is in space, making the light from stars crystal clear. Which suggests that atmosphere is responsible for twinkling…. Same planets are also far away in the sky. …Why do you think they don’t twinkle? Planets sometimes do *twinkle*. In very poor seeing conditions (with a turbulent, unstable atmosphere), planets can be seen to vary in color and change in brightness with the naked eye, though due to their apparent size, this twinkling appears somewhat “slower” and more subdued than with stars. The effect is most commonly seen with the naked eye in [northern] winter (when cold fronts produce turbulent atmospheric conditions) and when planets are close to the horizon. what a great explanation, because my daughter asked me and I wasn;t sure. Now we BOTH know. @KiranIndia -The reason is because planets are much closer to us. Because stars are so far away, only a tiny pinprick of light reaches us. It is much easier for the atmosphere to distort a pinprick of light (even though it is quite bright), than it is to distort the relatively large beam of light being reflected off of our neighboring planets. The light does get distorted, we just don’t notice it. Kiran, I think the answer is in the content above… “It is very bright, which can amplify atmospheric effects”. The others are nowhere near as bright as Sirius. Jupiter is quite bright, though. If what you are saying is correct, then Jupiter would be twinkling too. Indeed, Jupiter is often the brightest object in the night sky besides the Moon. called the Rayleigh criterion. The 1.22 comes from the evaluation of a Bessel function and physically is due to some diffraction. We can ignore this for the most part. The formula tells us that any object at a distance which has a size whose angular resolution is below ? will not appear. An example of this is driving at night on a long flat highway, where cars at a distance appear to have one light, but then as you get closer you resolve it into two headlights. The planets are close to the Rayleigh criterion, but we image them as disks. Even on the eye they are imaged as disks, just very small ones. The image disk is just spread out a little more on the retina than would be a star. A star appears on the retina as a diffraction “hump,” called an Airy function, due to the circular aperture. This spread is smaller than an object which is optically resolved. This is where the 1.22 comes in. Photons are emitted by stars or reflected from planets in spherical wave fronts. Physically this criterion means the photons coming from a planet arrive with a little bit of spherical shape while from a distant star the wave is essentially a plane wave. This means that anything which can be optically resolved will twinkle or shake if the turbulence is large enough. Look at Jupiter through the rising heat of a campfire and it will twinkle. For any object below the criterion it takes far smaller turbulence to make it shake or twinkle. For those who want that explained in plain English, here’s the Wikipedia entry: Scintillation (astronomy). All stars can appear to twinkle through the atmosphere, (except the Sun, of course). They are pinpoints of light and too far away to form a disc shape. Though millions of miles away, planets do not twinkle because they are still much, much closer than stars, and have larger reflective surfaces. If only we in the Southern Hemisphere could experience such a phenomena as our far more fortunate northern cousins..oh, wait, we do! And FAR more spectacular because Sirius sits high in the sky. It takes a bit of getting used to, but seeing Orion upside down reminds us that others around the globe see things differently. Why does everyone just think about the northern hemisphere? orion is the saucepan here in australia and at the moment we are getting great views of sirius as well. One reason we are Northern Hemisphere oriented is that most of the worlds population is in the Northern Hemisphere.Thus the majority of scientists as well. This is not a dig at the Southern Hemisphere, it is just a fact of Geo-politics and population distribution. And, you are incorrect to think that the Southern skies are ignored. There are several internationally operated telescope complexes in the Southern Hemisphere. UT does need more sourthern-hemisphere writers though! Canopus is low on the horizon where I live (around 33°N), but does not seem to twinkle with the range of colors that Sirius does. Why? As stated above: It’s less bright.